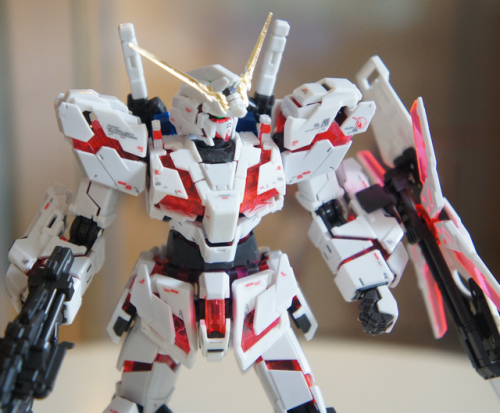 Prior to the announcement and release of the Real Grade Gundam Unicorn (”RG Unicorn”), I’d often shoot down people’s comments and hopes that Bandai would produce the said gunpla kit. 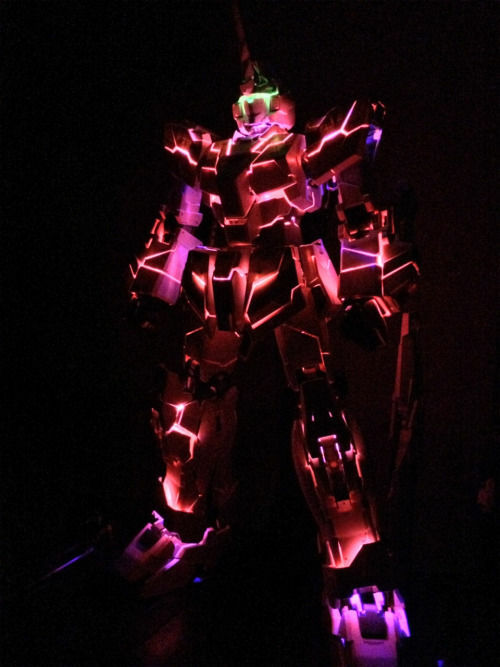 Having built the Master Grade Unicorn (”MG version”) a few years back, the MG version was finicky in its transformation especially around the knee and ankle area. Due to its slightly elongated proportion and weak joints, the MG version wasn’t capable of many dynamic poses in its destroy mode form. 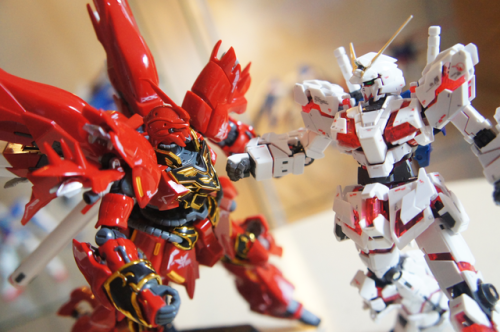 Given this past experience, I was almost certain that it would be impossible to engineer an even smaller 1/144 scale, fully transformable Gundam Unicorn - but I was proven completely wrong. Some of you might not agree with me on this since matters of design are largely subjective. 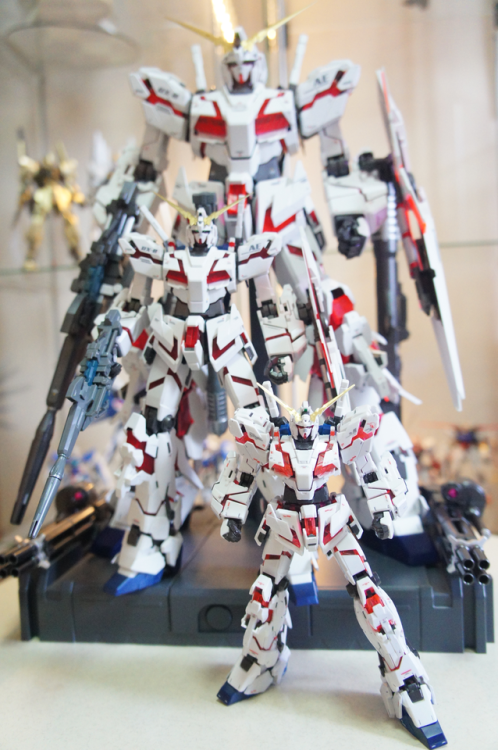 That said, I will admit that the Unicorn Gundam is my all time favourite mobile suit from the Gundam franchise. 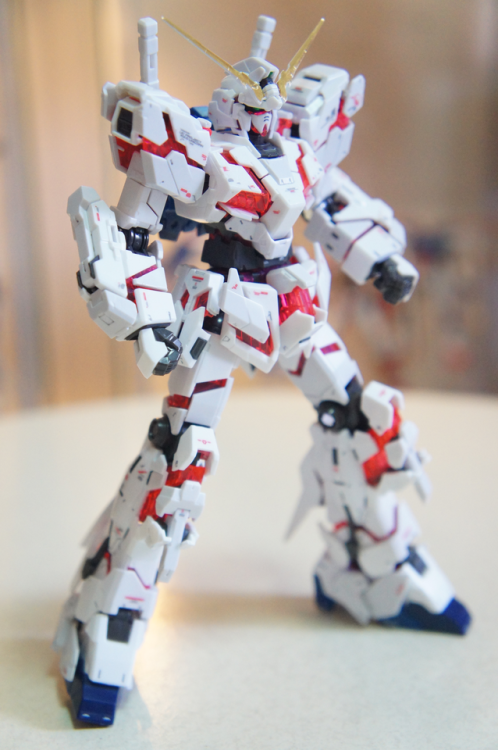 The proportion of the RG Unicorn is true to the anime and close to that of the Perfect Grade version (”PG version”). It doesn’t have awkward, longish legs like the MG version. 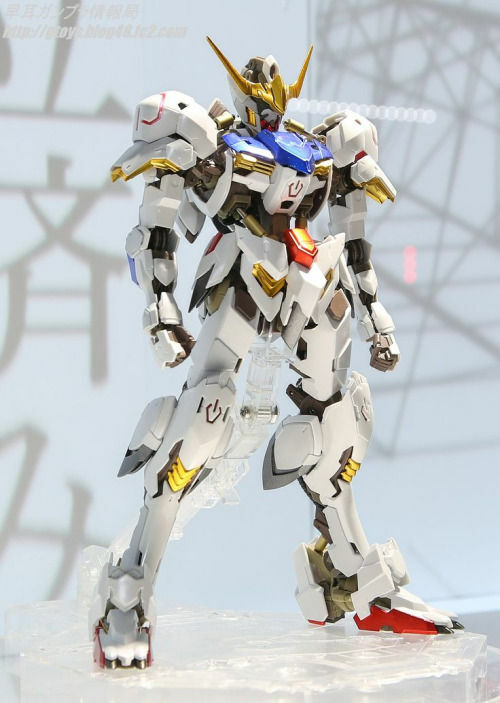 Also, in true Real Grade fashion, the armour comes with both white, and some off-white parts, even though the mobile suit itself is supposed to be almost entirely white. There are tonnes of decals as usual, which is up to the individual to decide how many to use, to give it a more “realistic” look. There are also lots of panel lining opportunities, in positions almost identical to the ones found on the PG version. If there was just something I had to nitpick, it’s the use of gold foil stickers for the V-fin. Use of the default gold foil stickers hides those line details that are found on the surface. 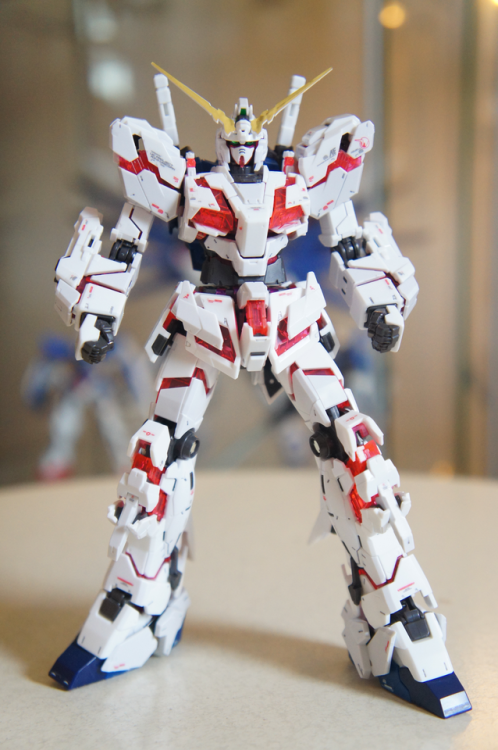 One of the main weakness of the MG Unicorn is the relatively limited range of motion found at the knee joint. There were hardly any issues on the PG version, and also, you’ll be able to get close to a 180 degree bend on the knees of this RG version. Most of the other joints do bend fairly well without any loose pieces coming off. Perhaps instead of focusing on the strengths, I should highlight a few of the weaknesses, so as to explain why I docked a point for the articulation. The rotation around the head and ankle areas are rather limited. Consequently, these limitations do reduce the variety of dynamic poses that can be done with this kit. 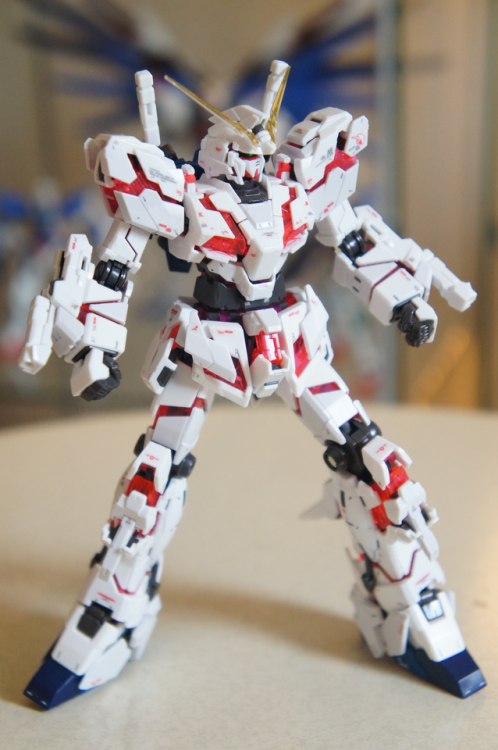 This aspect of the RG Unicorn has truly taken me by surprise and has far exceeded my expectations. Loose joints? Armour parts falling off? Balance issues? 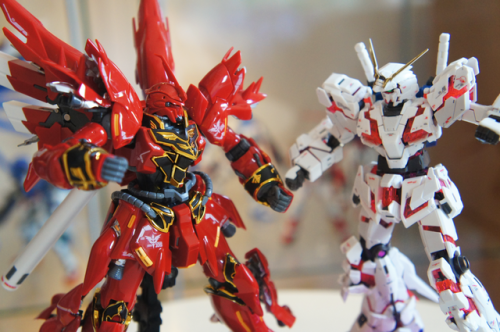 While these issues had plagued the Real Grade Sinanju (a beautiful but unfortunate kit) a year ago, thankfully, none of those problems were present with the RG Unicorn. This time, Bandai did not re-use an earlier Real Grade frame from a previous kit (which is something they’ve done on numerous occasions before), but instead redesigned the frame entirely for this 1/144 scale. The result is a wonderfully solid kit where the shoulder and elbow joints are strong enough to hold up its weapon accessories without being a victim of gravity. While the transformation from Unicorn mode to Destroy mode is not free from difficulty, it is MILES easier than the PG or MG versions. 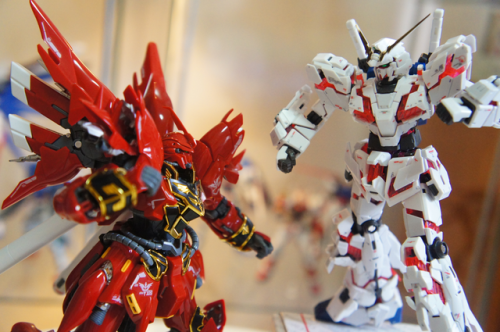 Take for example, the part where the knees pop out, the connection between the white armour and the red psychoframe connects easily and unlike the MG version, it does not fall off. Expanding / transforming the forearms and upper torso is also A LOT easier on the RG than both the MG and PG versions. You’d have to try them to really understand the difference. Transforming the head, while easy, is also a little different here. Instead of flipping the outer mask downwards to reveal the typical Gundam face, both sides of the face are built on the same little “cylinder” facing opposite directions and are rotated depending on the mode you choose to display it in. Although we are given 3 options for the horns/v-fins (fixed open, closed, and foldable), I’d recommend the foldable option without hesitation. I was really impressed by how the closed V-fin (foldable) is able to fold neatly into the unicorn mode without any gap or misalignment. In comparison, even though the PG Unicorn’s V-fin has magnets meant to hold them securely, the gap is still clearly visible. 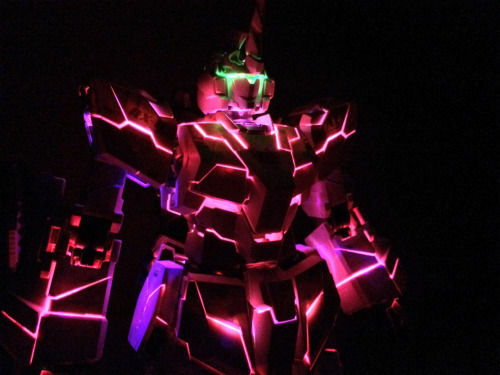 Whether it is in destroy mode, or unicorn mode, fiddling around with the kit does not leave me feeling as if I was about to cause some parts to fall off or break. I’m really not sure how Banai did it this time, but the engineers have finally worked their magic. This might be the best Real Grade kit that I’ve built so far. I’m currently putting together the RG unicorn gundam. I wonder if anyone might be interested in me giving a review of the kit when I’m done.